In general the Hill Collection contains publications issued before 1900. However some 20th-century bird books are included because they are rare, represent special gifts, or require special handling and storage. Among these titles are Lionel Rothschild's Extinct birds (1907), Frederick Du Cane Godman's A monograph of the petrels (1907-1910), and William L. Dawson's The birds of Washington (1909) and The birds of California (1923). Another major work included is the twelve-volume The birds of Australia (1910-1927), by Gregory M. Mathews. 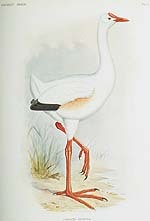 Archibald Thorburn's British birds (1916) is represented in four volumes, with volumes one and two being the second edition. The birds and trees of North America, by Rex Brasher, appears in the original twelve-volume edition of 1929-1932 as well as in the four-volume reprint version of 1961. And finally there is the 1944 Portuguese language edition of the important treatise by Jean T. Descourtilz entitled Ornitologia brasileira, originally issued in French in the 1850s.